The product type allows you to sell digital products like PDF, images, audio, video, software, e-books etc.Customer will be able to download the file immediately after making the payment. The settings in this type are almost identical to simple product except a very few. Since this is downloadable, obviously it has no shipping option. Likewise, there is no options page also, to choose a color or size, because it has no physical existence. But there is unique option Files for this product type. Have a look over that option. There are three options here to set before further action. 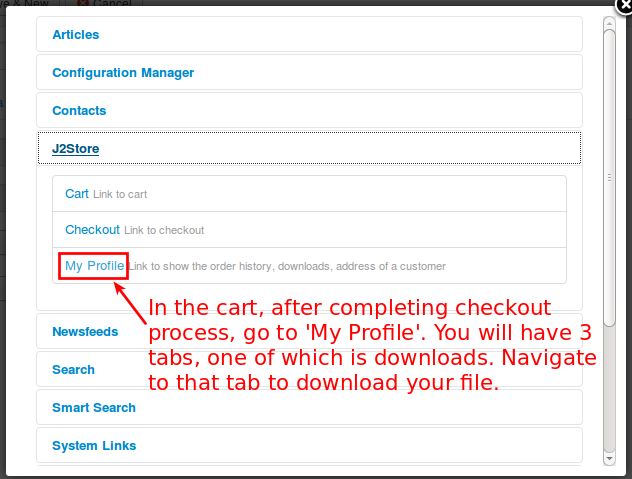 First there is a button to select the downloadable files to set for the customer to view. 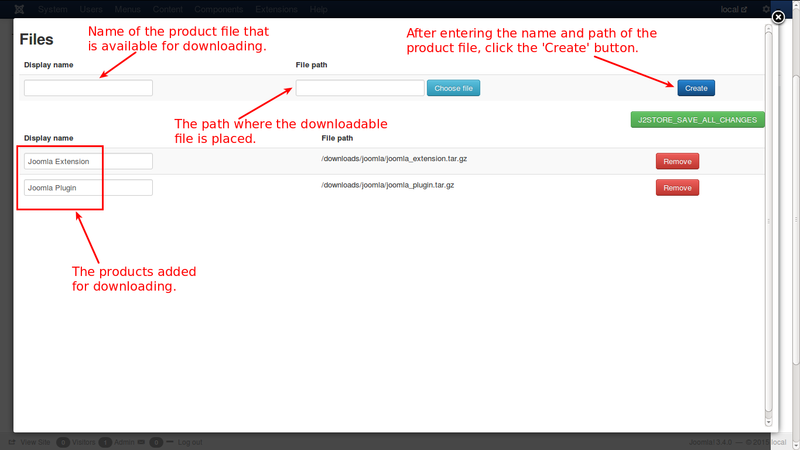 When clicked, it will direct to a popup window in which the display name and the path of the downloadable file are set. 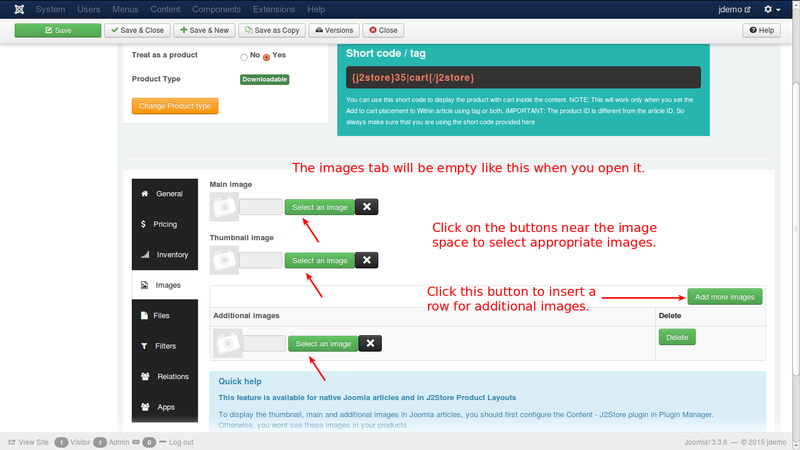 VERY IMPORTANT: In configuration -> basic settings, the File attachment path field should point to an existing directory inside your website root. If you specify a directory outside the public root, then you should enter the full file path manually. 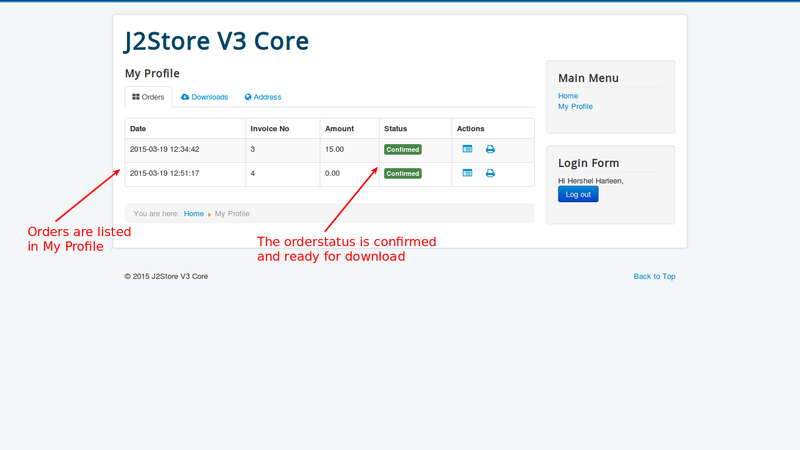 This determines the maximum number of copies allowed to be downloaded by a single customer. Enter a numeric value to set the limit. 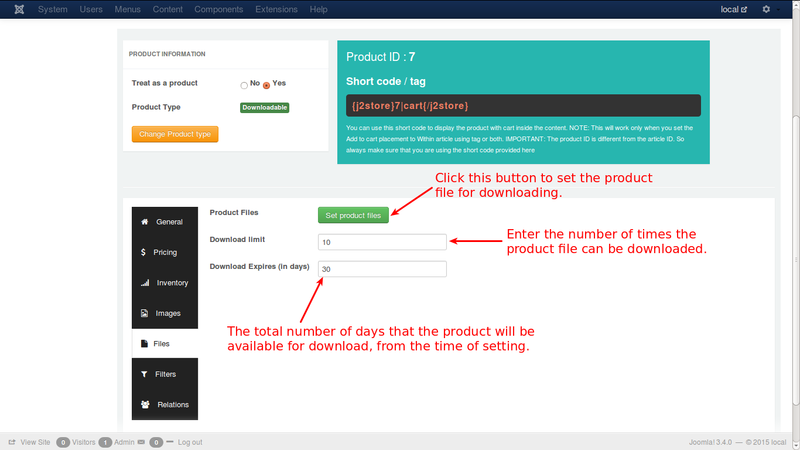 This will set a deadline for the product link to be active to download the product. If the deadline set to be 15 days, for instance, the link goes inactive on the start of 16th day. All other options are same as simple product. Select the type of the product, i.e., 'Downloadable'. 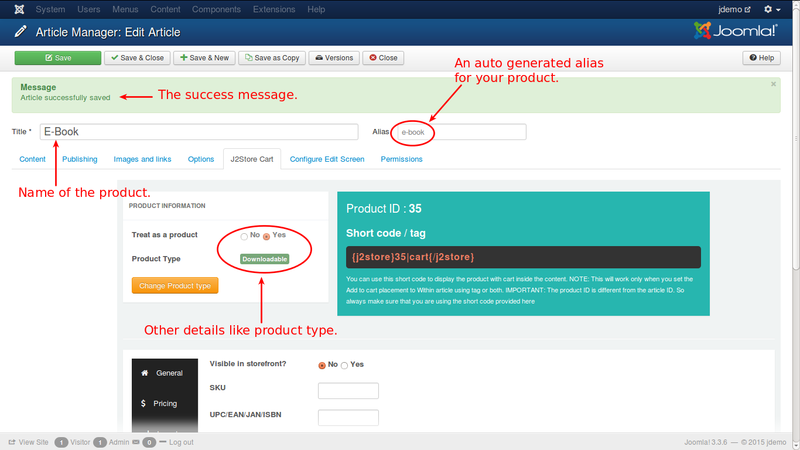 Add a description for the product, as illustrated below. 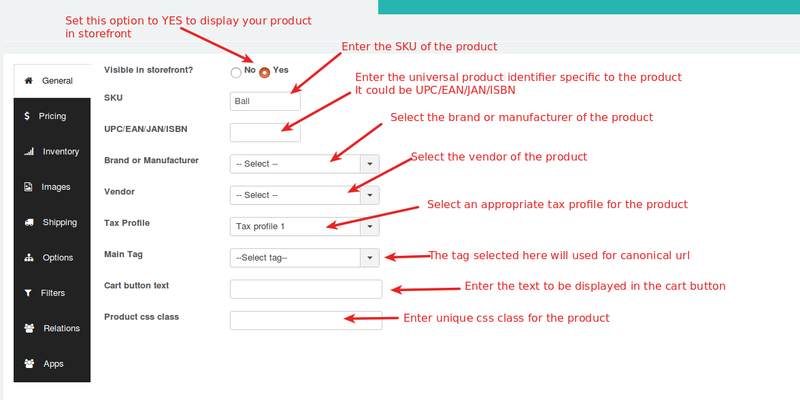 Enter the details as required by the fields in the tab, like, SKU, UPC/EAN, brand, vendor, tax profile and the caption for the cart button. Once you enter them, you can navigate to the next tab, pricing. 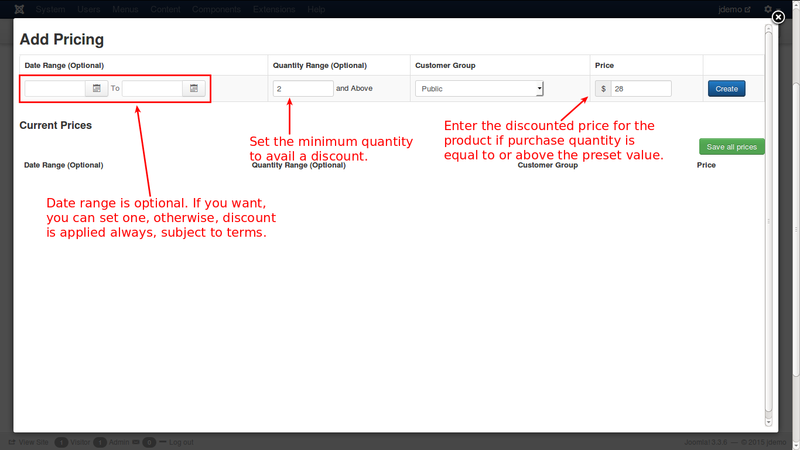 In the above image you set up the regular price for the E-Book. 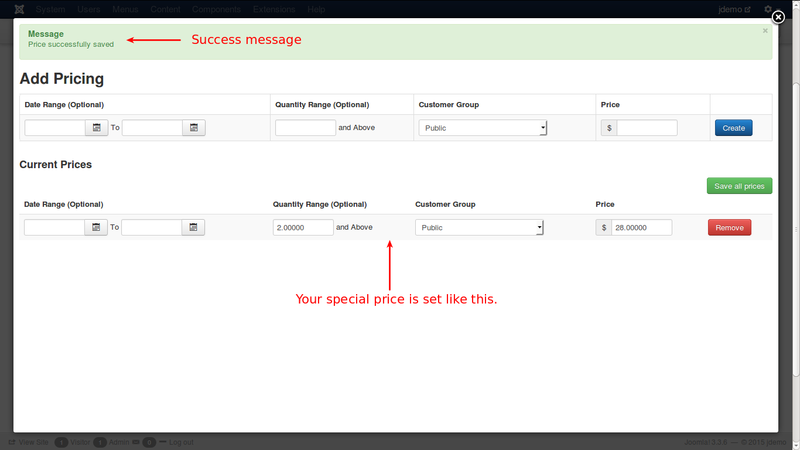 Click the set prices button to set advanced/special prices. It will pop-up a window to set the special prices, like this. 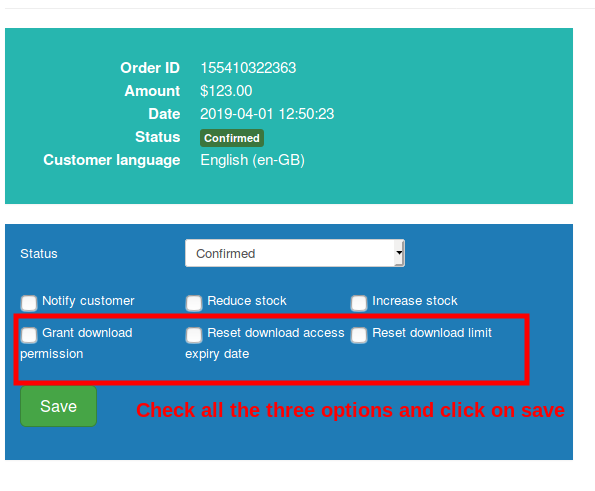 In the above image, you can set a date range for the special price, otherwise, you can leave it empty for the special price to be applied always. For example, if a customer buys 2 or more copies of the E-Book, you can offer a discount in price, throughout the year. 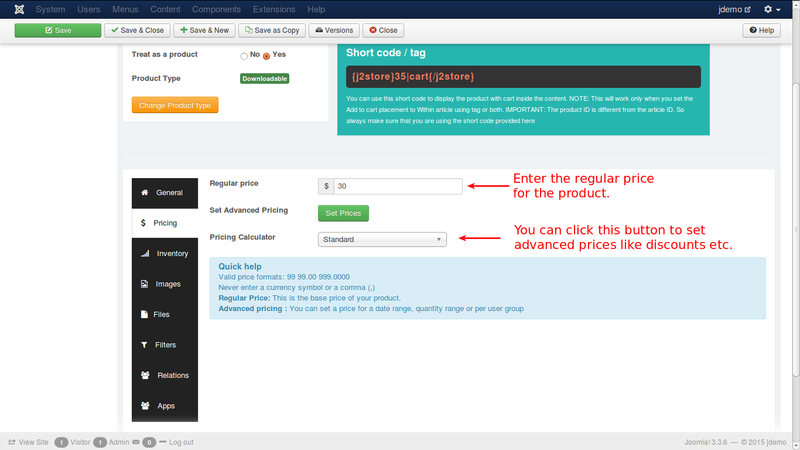 Now, you have entered the values, and click the blue 'Create' button and you will get the special price listed below, as shown in the image. When you select the images tab, you will get a screen like this. Once you finish the selection, your tab will be like this. Unlike other products, you do not have options and shipping tabs for a downloadable product. But there is a unique tab, Files is present here. 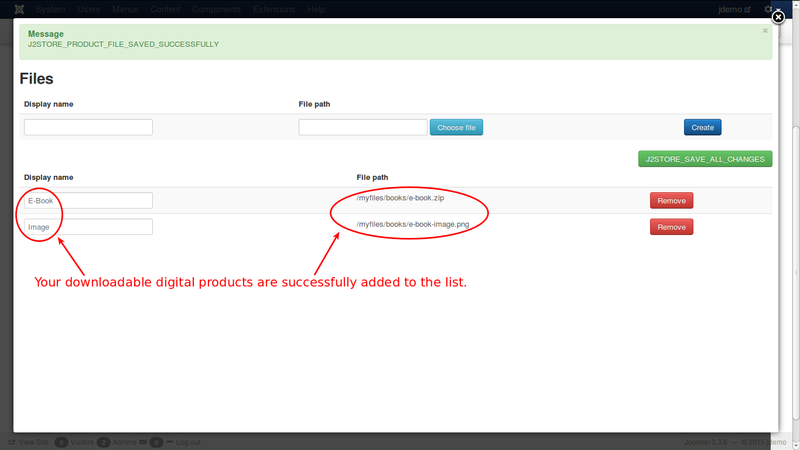 You must have a separate folder or directory in your site to place the downloadable products. From that folder, the product will be downloaded, when the buyer fulfills the requirements for the download. 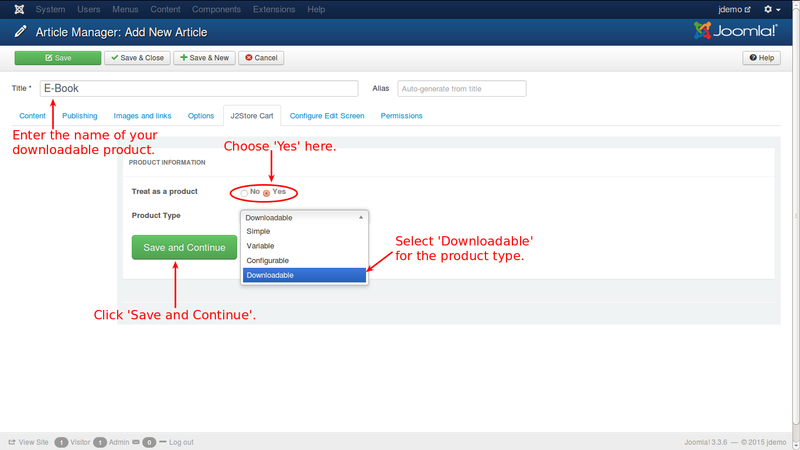 The following steps will guide you to set up a folder with downloadable product. You can use your Hosting Provider's CPanel File manager or an FTP client like FileZilla, to access your web root (public_html / www / httpdocs ). Once you are in the web root, you can create a folder. Name it as: myfiles. We do not want people to access this folder using their browser and download files. So let us protect this folder using a .htaccess file. Create a file called htaccess.txt in your computer and open it with your favorite text editor. Add the following lines to it. Save the file. 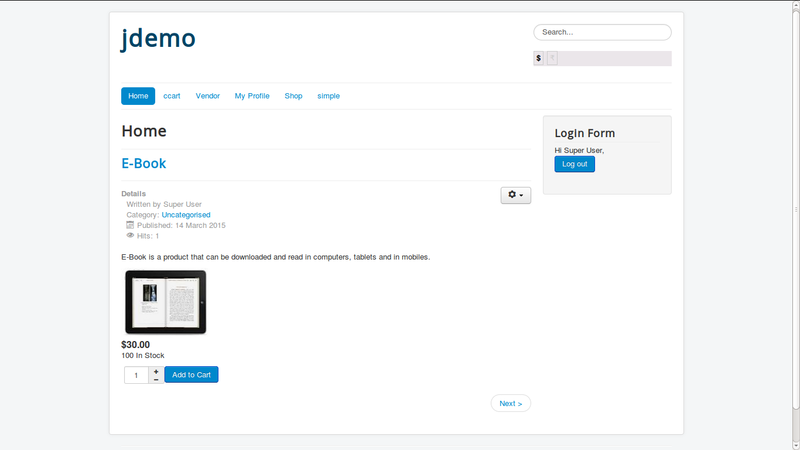 Now upload it to the folder we just have created in our web root. In our example, it is myfiles. All the files uploaded to this folder, are now protected. 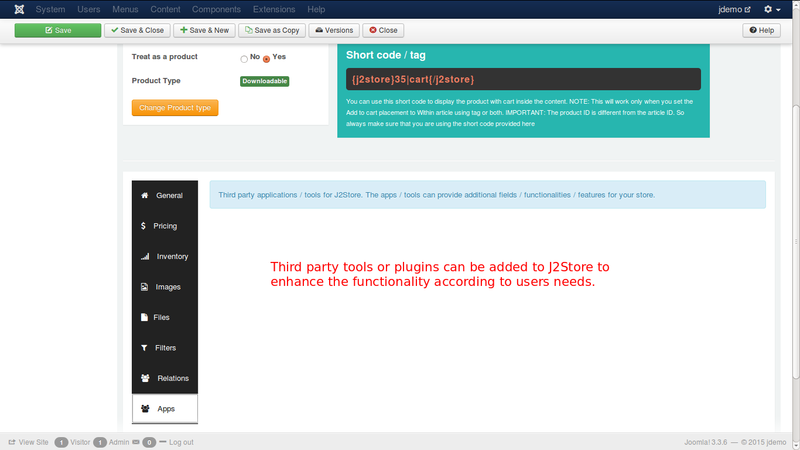 Step 3: Point J2Store to use the files in this folder. 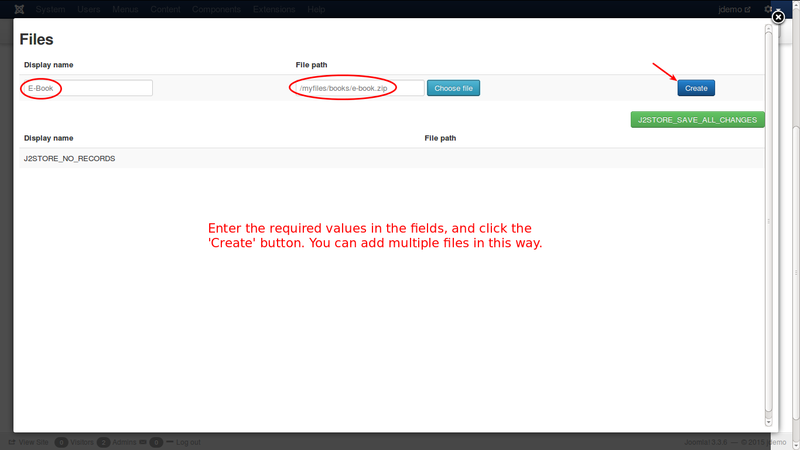 In File attachment path field, enter the name of the folder that contains your files. In our example, it is: myfiles. Finally, save the configuration. You have created a folder to upload your digital products like ebook, pdf files, image files etc., set up protection mechanism from unauthorized access and configured the folder in your configuration page. 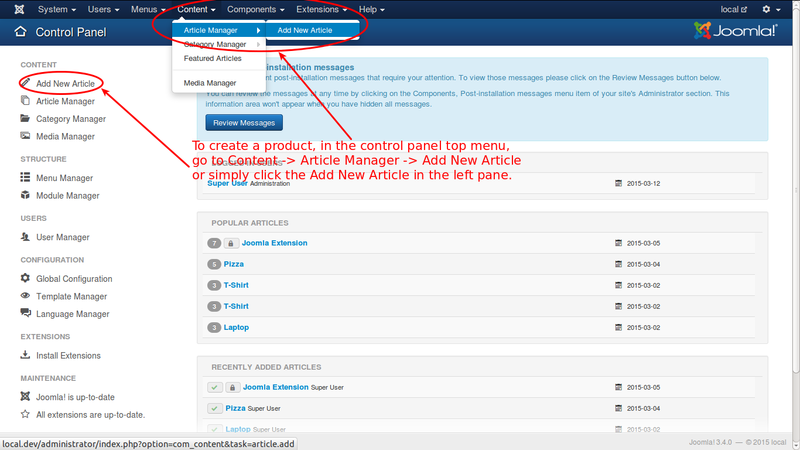 Now, Configure your Files tab in your downloadable product creation. 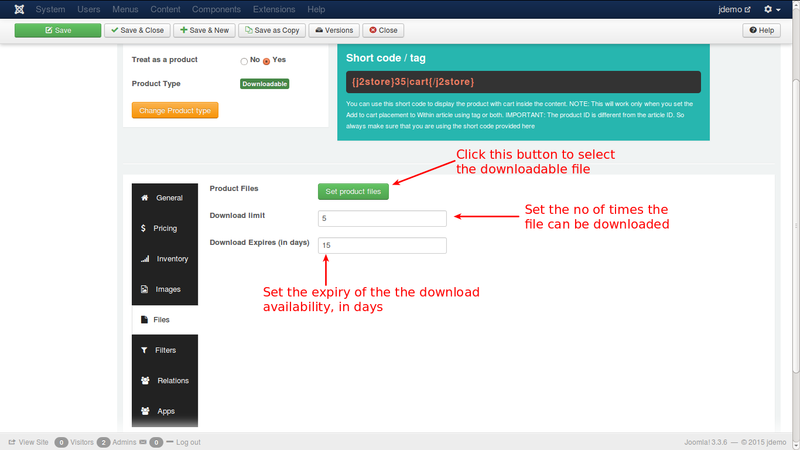 When you click the set files button, you will get a pop-window to select the file to be downloaded. See the picture. 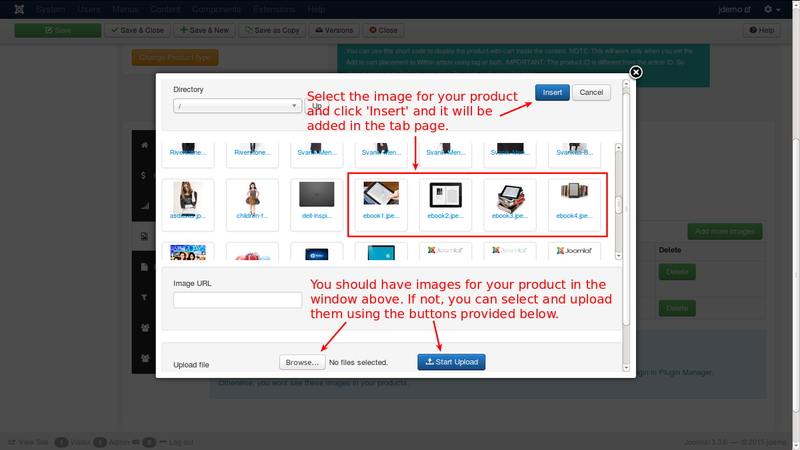 And select the file and click the create button, and you will get the product listed below as shown in the picture. You can add as many files as you can to the folder. 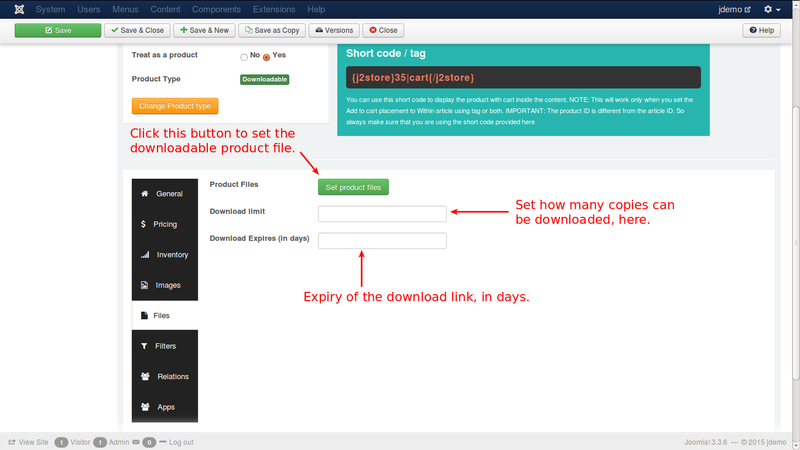 When a customer purchases the product, all the files associated with the product will be available for download. You just have to tell the customers to visit this menu to get their files after the purchase. 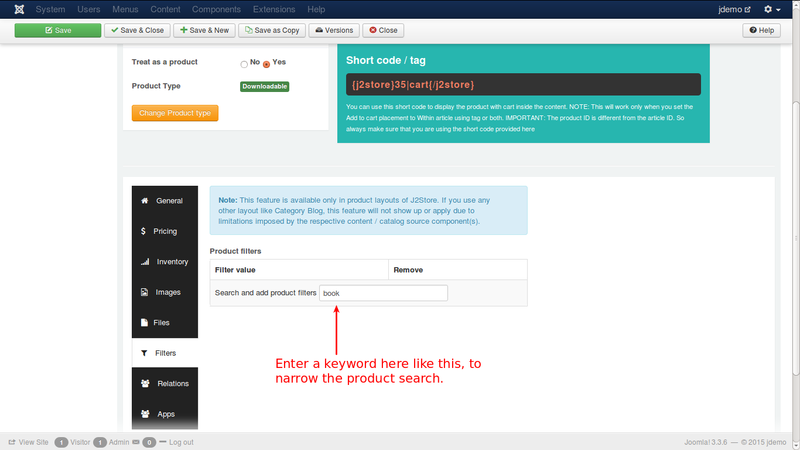 The filters will help to narrow the product search, for specific products. For e.g., if you add filter with value 'music', the search will display only music files. 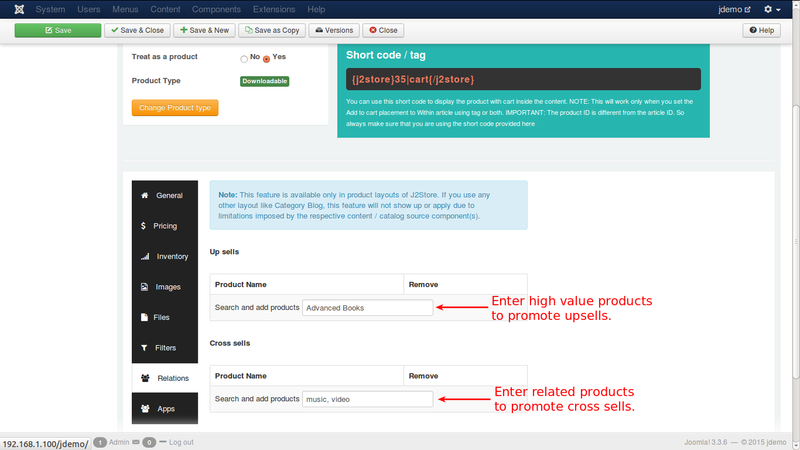 For more detailed explanation, refer to the Relations section of the Downloadable Product. How to sell files that are stored externally? 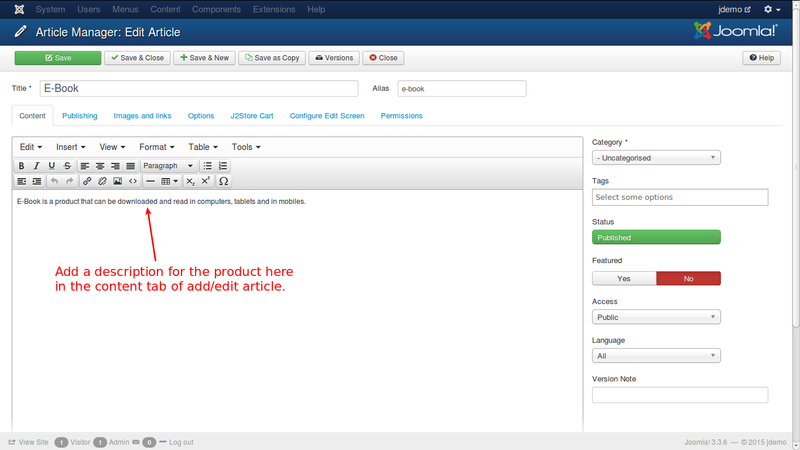 Let us assume that you have provided download limit for a product as 1 and the user has downloaded the file. Now, he wants to download the product again. 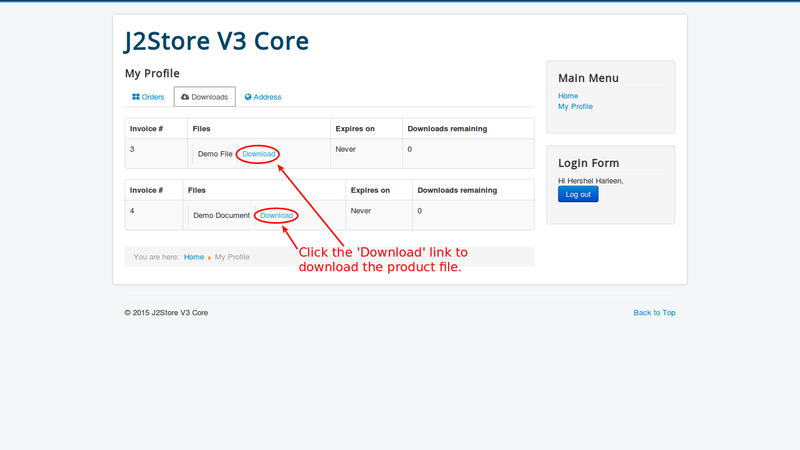 Please navigate to J2store->Sales->Orders-> Order of the downloadable product. 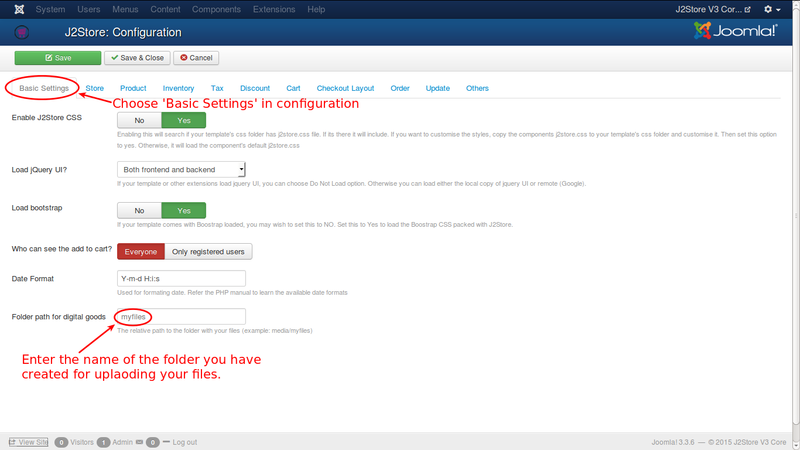 Click on the checkboxes mentioned in the below screenshot and click save. This would reset the download limit and expiry date only for that particular user. He would be able to login to his my profile page and download it once again the number of times you have allowed on the product.